WOW! Women On Writing Blog: Gloria Loring, author of Coincidence Is God's Way of Remaining Anonymous, launches her blog tour! Gloria Loring, author of Coincidence Is God's Way of Remaining Anonymous, launches her blog tour! When Gloria Loring began writing about turning points in her life she realized that coincidence was a key player in many of these events. So she began to wonder . . . what is coincidence? Just a quirky aligning of timing or something more? Soon she found herself on a self-guided trip through scientific theory, religious beliefs, and more as she tried to untangle the mystery we call coincidence. Coincidence Is God's Way of Remaining Anonymous is Loring's spiritual exploration of how coincidence helped her make sense of life's challenges and uncertainties. Coincidence helped her raise $1 million for diabetes research; it arrived in the form of mysterious letters during her separation and eventual divorce from actor-writer Alan Thicke; and it helped her discover and then heal from the trauma of long-forgotten childhood sexual abuse. It also brought her a chance encounter with the man she is married to today. With eloquence and humor, Loring takes readers on a quest for a deeper understanding of life's journey and the role coincidence plays in all of our lives, revealing that even the most difficult circumstances can be beneficial. Her experiences may be just the evidence readers need to begin watching more closely what they are attracting and what they are running from in their own lives. Coincidence Is God’s Way of Remaining Anonymous is available as a print and e-book at Amazon and Barnes and Noble as well as your local bookstores. To win a copy of Coincidence Is God’s Way of Remaining Anonymous, please enter using the Rafflecopter form at the bottom of this post. The giveaway contest closes this Friday, March 8 at 12:00 AM EST. We will announce the winner the same day in the Rafflecopter widget. Good luck! When not starring on the soap opera Days of Our Lives, Gloria Loring found herself expressing herself with music. She is the recording artist of the #1 hit song Friends and Lovers as well co-composer of television theme songs Diff’rent Strokes and Facts Of Life. Gloria’s new musical show TV Tunez, a celebration of television’s best theme songs that earned standing ovations, is in development for a Las Vegas run. She is currently in the studio with producer Ted Perlman and songwriting legends Burt Bacharach and Desmond Child. After her four-year-old son was diagnosed with diabetes, she created and self-published two volumes of the Days Of Our Lives Celebrity Cookbook which raised more than $1 million for diabetes research. She has also written Kids, Food and Diabetes, Parenting a Child with Diabetes, The Kids, Food & Diabetes Family Cookbook, and Living With Type 2 Diabetes: Moving Past the Fear. Gloria was honored by the Juvenile Diabetes Research Foundation with the Lifetime Commitment Award and the Founders Award from the National Disease Research Interchange. The Miss America Organization gave her the Woman of Achievement Award, an honor she shares with past recipients Barbara Bush, Roslyn Carter, and Hillary Clinton. She is listed in Who’s Who in America and Who’s Who of American Women. WOW: Coincidence Is God's Way of Remaining Anonymous spans many years of your life? How long did it take you from when you first decided to write your book until its publication? Gloria: Twelve years. I started the process in 1999, and at first it contained only my stories. Yet I knew I wanted it to be valuable to the readers, so I researched coincidence, reading dozens of books on the subject. And because Albert Einstein said the words that title by book, I began reading about the intersection of scientific observation and spiritual wisdom. What I found fascinated me. Then I read up on lives of the great saints and sages to better understand their spiritual experiences. All of it supported and expanded my perspective on coincidence, and yet even then I couldn’t finish the book. Some of my hesitancy was the fear that people might think it’s a religious book, because the word “God” is in the title. But when I noticed how many books on the bestseller lists were about spiritual issues, I realized the time had come. Only a few months after completing the writing, I found an agent and a very good publisher, HCI. WOW: Do I spot another coincidence? You’re writing a spiritual book, spiritual books are popping up on the bestsellers lists? But let’s get back to those twelve years. That is a long time. But of course, since most WOW readers are writer/something else—whether it be writer/teacher or writer/president of the PTA or writer/dog rescuer—we all understand about there not being enough hours in the day. In the beginning, how long did you expect it to take to write your book? Gloria: I thought it might take a year or so. I was also writing the songs that accompany each chapter at that same time, and imagined them as a “book with its own soundtrack” set. I finished recording the songs and released the CD, but each time I went back to the book, I realized there had to be more depth, more common sense, more expanded understanding. I took titling my book with Albert Einstein’s words and genius very seriously! WOW: First of all, I’m blown away that you wrote a soundtrack for your book! You have such a busy life: performing, raising money for diabetes, having a family, writing literary soundtracks! How and when did you find time to write? WOW: Oh, we all know that fear, no matter what type of book we're writing. But I'm wondering about the evolution of your book. Coincidence Is God's Way of Remaining Anonymous doesn't feel like a book that was planned. You don't seem like an outline kind of gal. Can you give us some insight into the creation of you book. WOW: So what happened when one year turned into two turned into . . . did you ever feel discouraged about not having enough time to dedicate to your writing? How did you keep yourself enthusiastic for your book . . . did you give yourself pep talks, did you have a group of supportive writers behind you, what made you keep going? Gloria: Until the last months, when I began to read and share chapters with others, I wrote the book with very little input. I just kept asking myself, is it true, is it real, is it useful? My favorite part was doing the research. I had files of clippings, pages of quotes. Coincidence was always working on my behalf. It seemed every time I picked up a magazine or book, I found something that fed the book. WOW: It's difficult to pinpoint your book . . . it's part memoir, part inspirational/spiritual, part self-help. It seems there is something for everyone. If you had to describe what type of book you wrote—in ten words or less—how would you describe it? Gloria: It’s a memoir with a message of healing and inspiration. WOW: You included many personal stories to help illustrate points throughout your book. Was it difficult deciding what to include and what to cut? Did you worry about telling family secrets or did you find it empowering? Gloria: Trying to understand my personal stories led me to find the wisdom, the teachings, and the scientific and spiritual perspective I found supported my experiences. My goal was to explain what I had been through and how coincidence leads us to what we need to know and what we need to grow. WOW: What's the single most important thing you learned during your writing? Gloria: To never again be afraid to tell my truth. WOW: That’s a powerful lesson to take away from your writing. I hope we can all gain as much meaning from our work. Can you tell us what will be next for you? Gloria: I do have the set-asides from this book, a few chapters worth of wisdom I had gleaned, that already has a title as a follow-up book. This summer and fall, I will be conducting workshops based on the healing principles in the book, and am also developing twelve “lessons on coincidence” with Dr. Alvin Jones for a CD set. I just completed the audio version for Audible.com and after reading through the whole book out loud for three days, I am thinking of creating a one woman show. The songs that begin each chapter so beautifully illustrate and illuminate the stories. I’m excited about all the possibilities ahead of me. It’s as if a new chapter of my life has begun. WOW: Oh my goodness, that last answer exhausted me! I may have to take sympathy nap! But I would love to see you in a one woman show based on Coincidence Is God’s Way of Remaining Anonymous. Call me when your show comes to Pennsylvania. We all face times when we're "on stage" as the center of attention (wanted or not)--everything from work presentations to wedding toasts to a solo in the church choir. Performer Gloria Loring gives tips on conquering stage fright. Learn more about the real person behind the Days of Our Lives character Liz Chandler with an interview of actress (and author) Gloria Loring. Soap opera star Gloria Loring reveals "The Good Use of Celebrity" and gives away a copy of her latest book Coincidence Is God's Way of Remaining Anonymous. Learn what an old soap fan has to say about Gloria Loring’s venture into the writing world. Stop by soaps.com for an interview with Gloria Loring, including a few questions from her soap opera fans. You'll also get a chance to win a copy of her book Coincidence Is God's Way of Remaining Anonymous. Learn more about how soap opera star Gloria Loring became a diabetes advocate and author enter to win her memoir Coincidence Is God's Way of Remaining Anonymous. Gloria Loring, actress, singer and diabetes advocate, tells you how to "Make It Up and Write It Down." She's also giving away a copy of her memoir Coincidence Is God's Way of Remaining Anonymous. Monday, March 25 @ Read These Books and Use Them! 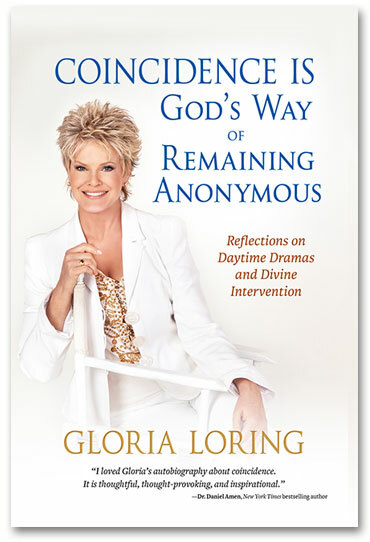 Learn more about Gloria Loring, actress, author and singer in an interview about her memoir Coincidence Is God's Way of Remaining Anonymous. After you read today's review of Coincidence Is God's Way of Remaining Anonymous, you'll jump at the chance to enter and win a free copy! We've all had them. Some we remember fondly. Others we wish had been exiled to a deserted island. They're lousy boyfriends and that's what actress, diabetes activist and author Gloria Loring wants to talk about today! Join the fun and get a chance to win her memoir Coincidence Is God's Way of Remaining Anonymous. Book Giveaway Contest: Enter to win a copy of Coincidence Is God’s Way of Remaining Anonymous! Just fill out the Rafflecopter form below. We will announce the winner in the Rafflecopter widget this Friday, March 8. I believe in divine guidance and intervention in our lives. I think sometimes I forget that the "coincidences" in life may be more intentional than I realize. I also think, as you've clearly lived in your life, we have to be willing to knock on doors and walk through them. Like a tapestry, all the threads that sometimes don't make sense when they're being woven, ultimately form a beautiful and complete picture that become our life. Thanks for sharing your story, Gloria. All the best to you with your book-- may it touch lives and inspire hope. I've been fortunate enough to have already read "Coincidence is God's Way of Remaining Anonymous." After reading Gloria's inspiring book, what struck me was the honesty and wisdom within the pages. Congratulations, Gloria, for writing such an inspiring book, and thank you Jodi and Gloria for a great interview. Thank you Jodi for your enjoyable, creative interview. Thank you Gloria for your honesty and inspiration. Can't wait to read your book (that I hope to win! :)) WriteON! Here's a coincidence--I was just talking about coincidences with my husband yesterday and about how sometimes I think God has a plan for us, and we just can't fight it. He's an air traffic controller, so more than likely, we are going to be affected by the sequestration you keep hearing about in the news. On the same day that this seemed to be a reality, I got an email for a freelance job from someone I hadn't heard from in a year. Coincidence? :) I would love to read this book! After I left my marriage, my counselor told me I was a tenacious survivor. She asked me how I managed and I shared that I always believed that the right people or the right things were always there for me when I needed them. Some people saw them as coincidence, but I saw them as gifts from God. Thanks for sharing your story, Gloria! I love reading stories about synchronicities that occur in people's lives. It's fascinating and makes me feel hopeful about life. If we set intentions, the Universe can orchestrate things in ways we might never have thought of. I plan on reading this book! Inspiring interview, Jodi and Gloria! My hubby and I have been talking about coincidences a LOT this weekend. On Saturday, he took his new motorcycle for a ride because the weather was gorgeous here in Southern California, around 80 degrees, and he wanted to ride up the coast. By chance or coincidence he stopped by a used motorcycle gear shop and found a leather jacket that fit him perfectly. A few minutes before he came in, a guy almost purchased it but decided against it because he was too tall, so the length didn't fit him exactly right. My husband put the leather on and went riding. Not even five minutes after he left the store, a tow truck swerved into his lane and sideswiped his front tire. My hubby's bike slid under a car and (it's totaled), and he went sliding across the street. Then the tow truck driver just took off!! There were witnesses, but nobody got the guy's license plate. TG, he's okay except for some road rash, but it was the jacket that saved his body. It would've been hamburger. Seriously. I don't know if that's coincidence, divine intervention, or just luck, but it's been tripping us out all weekend. Wow, Angela! So glad your husband is ok. What a terrifying experience. The "coincidental" jacet purchase story probably could have been included in the book. I do think it's important to follow our intuition/gut feelings because that's what leads us to say, stop by a motocycle shop out of the blue. Thank you so much for sharing your thoughts about my interview with Jodi, and about my book. And yes, Angela, your husband is so fortunate. I have come to understand intuition as the inner form of coincidence, both inner and outer giving us clues, leading us on. That's the beauty of Albert Einstein's words, "Coincidence is God's way..." They lead to a life of personal adventure, watching for the ways the magnificence intelligence that created us is working on our behalf. What an insightful interview! I can't wait to read Gloria's book now. I am so glad your husband listened to his intuition and stopped at that motorcycle shop, Angela! And yes, over the years I too have learned to NEVER ignore my intuition. When I was 16 years old, intuition made me realize a van full of young men who stopped me in a parking lot as I was leaving work did not have my best intentions at heart. Intuition was screaming at me to run, and I did. Intuition also screamed at me this past summer, telling me to quit ignoring my doctor's orders to get a baseline mammogram at age 35. I finally listened, and two diagnostic exams and an ultrasound later, I have a wonderful radiologist who has decided I should come in twice a year so they can keep an eye on one specific area of calcification. And the time a few months ago when I was late for my massage appointment because I couldn't find the gift certificate for it? I missed being caught up in a horrible traffic accident on the highway by about ten minutes, the exact amount of time I spent searching for the lost gift certificate (which I NEVER found), by the way. I got to the appointment late, grateful, and the spa didn't care that I didn't have the piece of paper with me. Thank you for that sweet comment, Gloria! That sounds like it will be an amazing site. I truly believe many people don't realize the magnitude of all the "synchronicities" that occur in our lives, as MP mentioned. We would be so much better off if we did. Thank you for writing this book. I believe it will be a blessing for those that think lots of things are all "luck". God is behind everything that happens! Thanks, Tricia. It has been , and continues to be, an amazing journey.